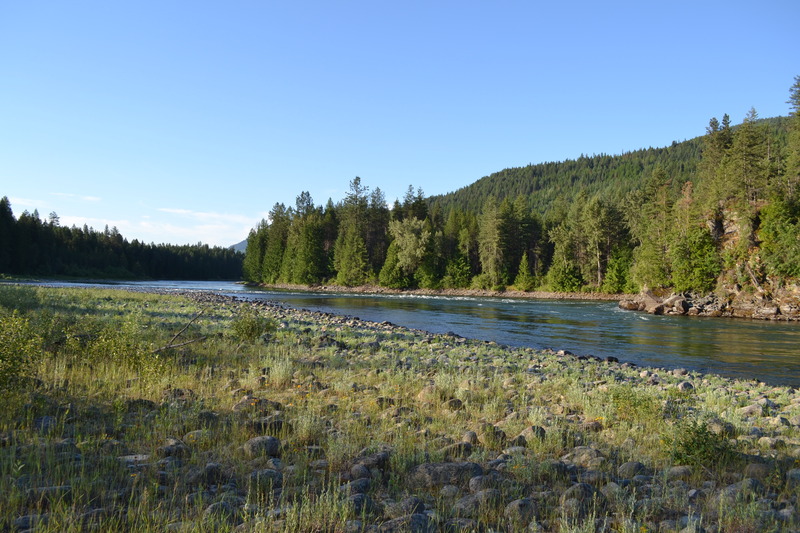 North up the length of Flathead Lake to Kalispell then northwest through Libby and into the tall trees forest. Passing north of the lake there were several fields of bright yellow flowers – WOW! I like yellow so these fields are my favorite! We stopped for lunch in Libby and ate at the Rosauers Market. The staff in the deli was every so happy to see me! I don’t think it was just me, I think they are happy to see everyone! There is a huge metal hawk (or eagle maybe?) 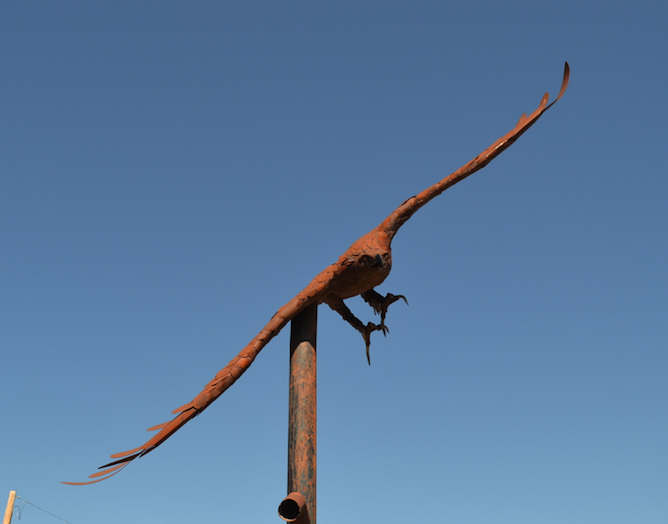 in the city center (Libby) and quite a few smaller bird-of-prey statues around town. The forest in this part of the world is much healthier than the forest in Colorado. I estimate about 1/2 the trees standing in Colorado have been killed by the pine beetle while there are very few standing dead trees in NW Montanna. There is a lot more logging going on in MT too. About one train per hour rolling down the tracks loaded with timber products. MT’s trees are also bigger than CO’s trees and the forest under-story has many small plants growing in the shade of their bigger cousins. I haven’t been here in the wet season but I suspect it’s a lot wetter than CO is. 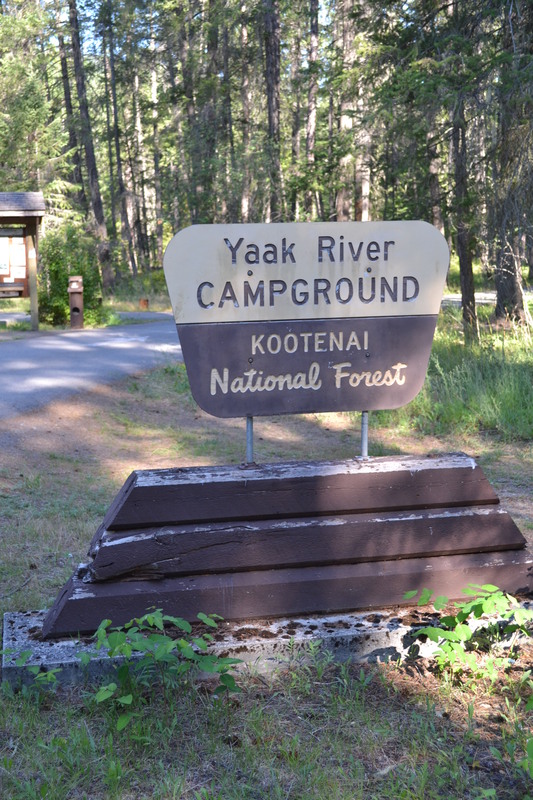 The Yaak River splits the campground in two so we camped on the north side of the river. Tall trees blocked the sun from reaching down to the solar panel and exciting the electrons therein so we had to go easy on the electricity that night. Even though the campground is between the highway and the RR tracks it’s mostly quiet. Highway traffic is minimal at night and there are no whistles from the trains. Tech report: No cell service between Troy MT and Bonners Ferry ID.